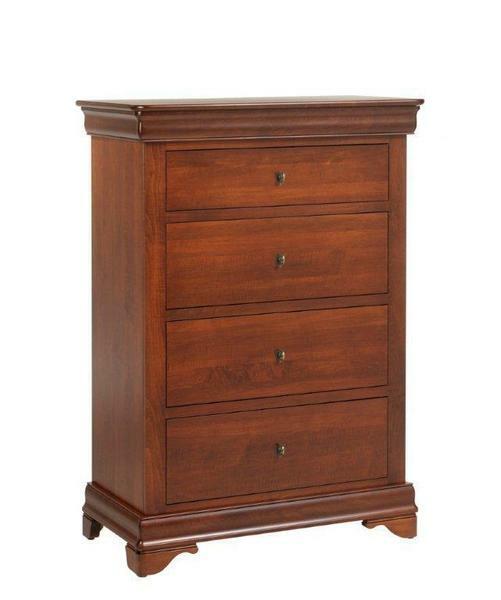 Amish Versailles Chest of Drawers 38"
Accentuate your beautiful bedroom suite with the sophisticated style of our Amish Versailles Chest of Drawers. Featuring four fully extending drawers and a hidden top jewelry drawer, you're sure to have ample room to store all of your valuables and clothes in a convenient location! Each piece in our Versailles Suite is handcrafted from select pieces of North American hardwood and bench-built using Old-World Amish techniques, resulting in heirloom quality bedroom pieces that are sure to last you and your family generations! Invest in your bedroom oasis with confidence! Please call on our of Amish Furniture Specialists today! We can help you with your questions and start your order by phone. We also offer stain samples, so you can be sure to get the perfect piece to match your decor! (Item 40898) Amish Versailles Chest of Drawers 38"